On older Android devices or iOS handsets, the *data management and notification settings might not be available. 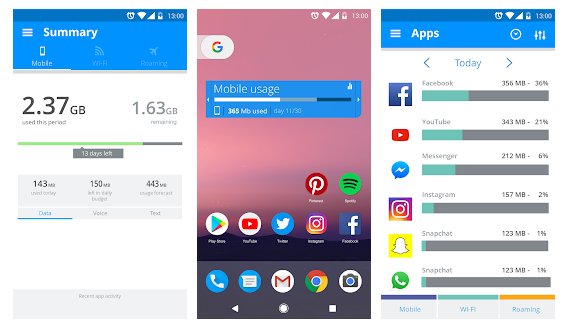 By installing a third-party application, you will have a whole range of settings available to track your mobile data usage on your handset. Although there are many data management apps out there, we've found My Data Manager to be efficient, simple and, best of all, free*! 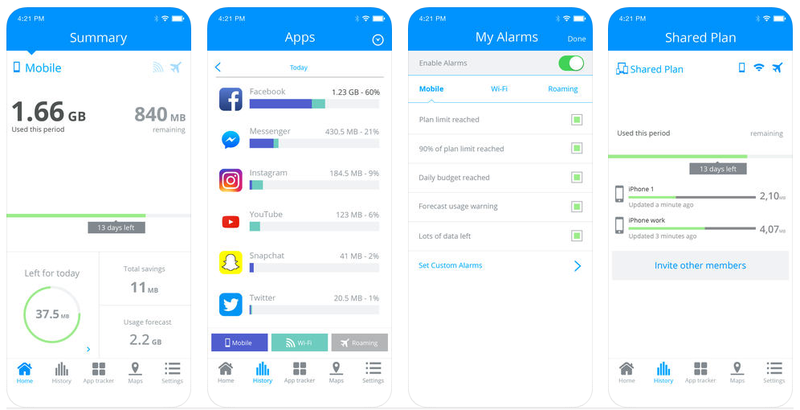 The app differs slightly for Android and iOS, but both versions allow you to monitor your use, and set a limit to your data use. If you're on a contract, you'll also find it very useful to track your use over time, allowing you to evaluate whether you're on the right plan or could do with beefing up your monthly data allocation. My Data Manager will also allow you to see which of your apps is using your data, even in the background - this can be a big culprit in mysterious data use. From the Google Play store, go to My Data Manager App by Mobidia Technology. Install and run the app. Under the Summary page your mobile data usage and Wi-Fi data usage will be displayed. Note: A cycle is a calendar month. This sets the data limit at which you will receive a warning notification. Note: The data usage will reset to zero at the beginning of every month. Navigate to Settings (top left) > My Alarms > Set Custom Alarms > Choose a value in MB or GB for Alarm #1 and Alarm #2. From the App Store search for the latest version of the My Data Manager. Install and run the app. It will ask to enable app tracking, location tracking and alerts. Choose to allow these features, as this will provide the necessary information we are looking for (this can be disabled or enabled in the app settings). Under the Mobile Summary page, your Mobile data usage for the month will be displayed. This sets the data limit at which you will receive a warning notification. Note: The data usage will reset to zero at the beginning of every month. Navigate to Settings (bottom left) > My Plans > Set Mobile Plan > Set Individual Plan > Choose your Mobile data plan under Plan Type and choose a Data Limit value in MB or GB. Tap Next and select Renew Data for your mobile data, usually the 1st of every month. Navigate to Settings (bottom left) > My Alarms > Under the Mobile heading, go to Set Custom Alarms > Choose a value in MB or GB for Alarm #1 and Alarm #2. The best way to save money on data is to make sure you have an active data bundle. You can buy data bundles quickly and simply on the My Vodacom App.